The terms like Internet security, cyber security, and cyber threat are the hot topics these days. What used to be a hot research topic among the future millionaire geeks, is now the biggest security concern. The Internet itself is a revolutionary breakthrough that changed the course of history and the World Wide Web is the cherry on the cake. Its growth has been astounding and the Web is ubiquitous. So it would be safe to say that internet security is not very different from other forms of security. The Internet is new, so the risks are less known and as we are more connected now than ever, we are just doing potential cyber criminals a favor by opening a window for them to sneak in. This is why we have antivirus software installed on our systems to protect our data and personal stuff from prying eyes. We look at the two big antivirus companies Norton and Webroot and see how they stand up to each other. Norton is one of the biggest antivirus software vendors operated under the ownership of Symantec Corporation as part of Norton’s software suite of computer security products. It is still one of the prominent and trusted names in the antivirus business with a sizable portfolio of award-winning security products. Symantec is a major vendor of security packages to protect personal computers and is a Fortune 500 company. The company was founded in 1982 by Gary Hendrix in Mountain View, California and was funded by a grant from the National Science Foundation (NSF). The company was initially focused on artificial intelligence projects and built a natural language database application that ran on DEC computers. Now, Symantec is a global software company that owes its fame to Norton. Symantec sells its PC antivirus package under the name Norton Antivirus. Webroot Inc. is a privately held company headquartered in Broomfield, Colorado that provides next-generation endpoint security to consumers and businesses. It is a big name in the cybersecurity space and the industry leader in combating spyware, and of course, the maker of the award-winning Spy Sweeper. The company was originally founded in Boulder, Colorado in 1997 to provide computer users with privacy, protection, and peace of mind. Steven Thomas founded Webroot from nothing and turned it into a global company that is now responsible for providing security solutions, innovative products, and services to millions of users around the world. Webroot is now one of the major software vendors of computer security products that provide its services to individuals, small to large business organizations, education institutions, and more. The company’s biggest achievement is its first automated spyware research system, Phileas. – Norton is a multi-OS protection antivirus software developed and sold under the ownership of Symantec Corporation as part of Norton’s software suite of computer security products. Symantec is a major vendor of security packages to protect personal computers and is a Fortune 500 company with a global community of millions of users around the globe. 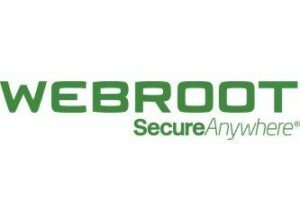 Webroot Inc. is a privately held company headquartered in Broomfield, Colorado that provides next-generation endpoint security to consumers and businesses. It is a big name in the cybersecurity space and the industry leader in combating spyware. – Norton is a well-known name in the cybersecurity space with a sizable software suite spanning a vast landscape of internet security solutions that provide sophisticated and reliable security solutions and services to individuals and businesses alike. It provides solid security against all kinds of threats including viruses, worms, spyware, Trojans, and more. Webroot is a strong contender with award-winning products under its portfolio including Spy Sweeper and Phileas. It provides all-around security solutions through its vast array of software packages and it has something for everyone’s need. So, both are equally capable when it comes to security. – Norton is a recognized and lightweight security system that efficiently manages memory when scanning for potential viruses while keeping memory usage at the minimal level, plus it also removes the unwanted memory periodically. It does all that with a little or no impact on the performance of your system while using fewer system resources as possible. Webroot is also a lightweight security system that does not tax the system resources that much but it is not as memory efficient as Norton and so puts less focus on the system performance. – Norton antivirus packages provide security solutions to suit every individual’s basic need – that is protection for their computers, phones, and other devices. Norton Security Standard can be bought at $39.99 for a year that includes all the basic features and utilities you’d expect from a good antivirus software program, plus there is a Norton Security Premium plan that costs $54.99 a year for up to 10 devices. Webroot costs $79.99 a year for support up to 5 devices, while the basic plan costs $19.95 for the Spyware Sweeper, which is just an addition to the already existing antivirus plan. The standard plan costs $29.95 for all the features you need. In a nutshell, Norton is a reliable yet sophisticated antivirus program and one of the prominent names in the cybersecurity space, considering it’s been around here for a long time. Norton triumphs in malware protection, and it puts less impact on the system performance. In fact, its software suite of antivirus programs provides some of the best malware protection around the world. Webroot, on the other hand, is a worthy competitor in the security business which specializes in spyware protection and enterprise security. Well, it’s almost as lightweight as Norton but not as memory efficient as Norton. It excels in spyware protection though. But Norton is a bit ahead of the game. Sagar Khillar. 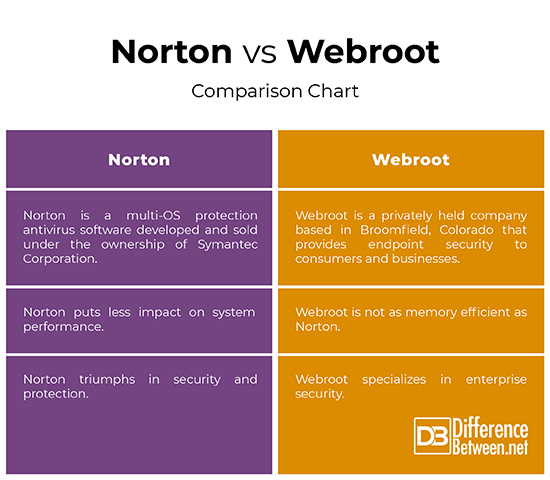 "Difference Between Norton and Webroot." DifferenceBetween.net. April 4, 2019 < http://www.differencebetween.net/technology/difference-between-norton-and-webroot/ >.